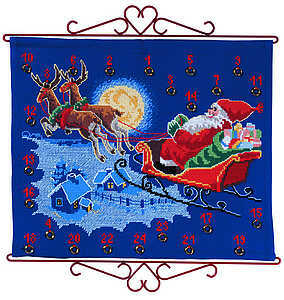 A colourful wall hanging with Santa in his sleigh pulled by reindeer flying over a wintry scene. 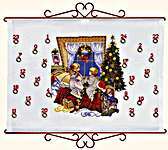 The kit has a large scale chart and key printed on an A3 sheet and the design is worked in 18 shades of stranded cottons in cross stitch, half cross stitch and backstitch. The stitch count is 150 by 120. The 50 cms red heart hangers are not included in the basic kit but are available in the variant or from our Supplies and Accessories section.